Egypt's Masry reached the group stage of the African Confederation Cup for the first time after earning a 2-1 victory over Gabon's C.F. Mounana in Port Said to complete a nervy 3-2 aggregate win on Tuesday. 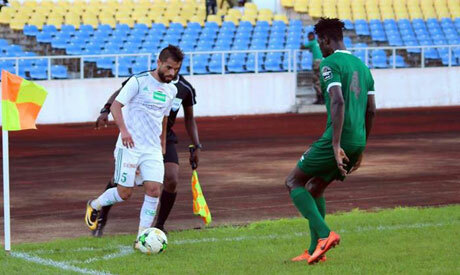 A 0-0 draw would have been enough for Masry to advance after holding Mounana to a 1-1 stalemate in the first leg in Libreville but they took a deserved lead through Burkinabe defender Mohamed Koffi to go ahead in the second half. Louis Autchanga stunned Masry when he finished off a swift move six minutes past the hour mark to level the aggregate score and revive Mounana's hopes of going through. However, a fine individual effort from Masry's in-form winger Islam Eissa, who also created the opener for Koffi, led to Mounana's Dieudonne Nkoume scoring into his own net with 15 minutes remaining as the hosts breathed a sigh of relief. It's the first time for Masry to reach the group stage of Africa's secondary club competition on their third appearance. Masry laid siege to Mounana's area from the outset, launching a wave after wave of attacks. Forward Ahmed Gomaa sent a free header wide after 19 minutes and Islam Eissa, who unsettled Mounana's defence throughout, blasted just over the bar from a tight angle in the 36th minute as Masry mounted pressure. Despite their dominance, Masry were vulnerable to counter attacks and Mounana could have stunned them late in the first half when Jerry Nzamba missed a sitter after breaking clear on the right hand side of the area. But Masry managed to break the deadlock in the 59th minute when a free-kick from the impressive Eissa found Koffi unmarked at the far post to beat the keeper with a deft header. The ecstatic home fans were silenced though as Mounana equalized seven minutes later, with Autchanga latching onto a through pass to go clear unopposed and send a low shot past wrong-footed keeper Ahmed Masoud. Eissa came to Masry's rescue in superb fashion, helping his side to a precious winner in the 75th minute. Making a marauding run on the left, he skipped past Bourama Coulibaly before sending a cross that eluded the keeper and was converted into his own net by Nkoume.